It was our February half term a couple of weeks ago and the schools in Fife were off for 3 days. 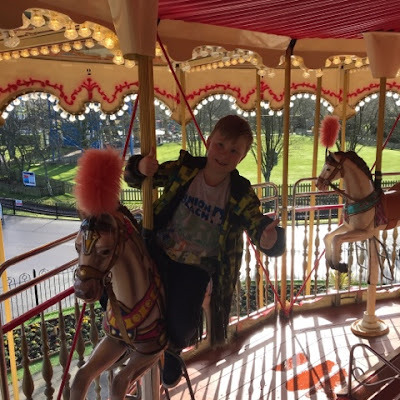 Instead of mopping around the house and watching the kids fight I decided to book up a staycation trip and visit Paultons Park down South in Romsey, Hampshire. 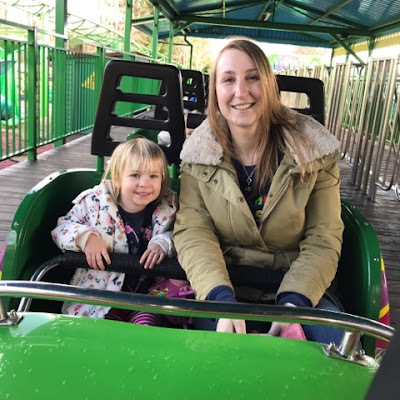 Paultons had a half term deal on their website where you could book and stay with a partner hotel (some included breakfast) and receive two days tickets to enter the park. So that’s what I did. There were several hotels to choose from and prices varied but I went for the Moorhill House Hotel situated in the New Forest 13 miles from the actual park itself. Like previous trips down South we decided to drive. According to google the drive down should have taken around 7hrs ish but in reality the traffic plays a big part with busier roads so it actually took us 11hrs!! And that was leaving at 8.30am in the morning. It’s worth it though as Paultons is a lovely park which has Peppa Pig World inside it too. When we arrived at the hotel we couldn’t wait to check in and get some sleep. Our room was spacious with a big bathroom, small table and chairs, huge bed and bunk beds for the kids. It’s all we needed as we had no intentions of spending any length of time in our room. 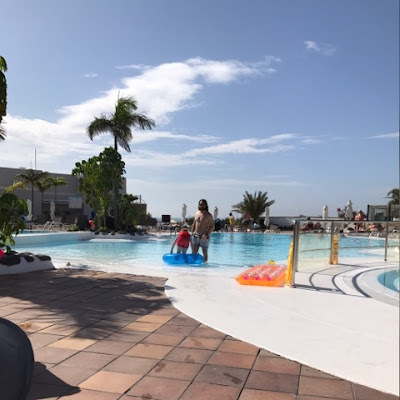 It’s worth mentioning that this hotel is dog friendly so you can bring your pooch which is lovely and there’s also ample free parking. Just drive slowly through the New Forest to reach it as there’s horses running free! 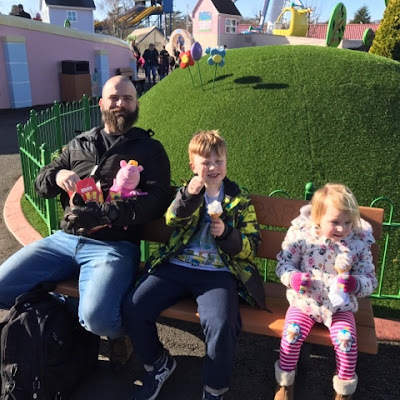 On our first morning we woke up bright and early, filled our tummies with a scrummy hot breakfast and headed to Paultons Park for it opening at 10am. We were 15 minutes early however the staff at the entrance scan your tickets so you can go straight in and have a nosey at the shop before the actual park gates open at 10am. I took the family straight to the first aid office as this is where you can collect a Queue Assist pass if a member of your party needs it. 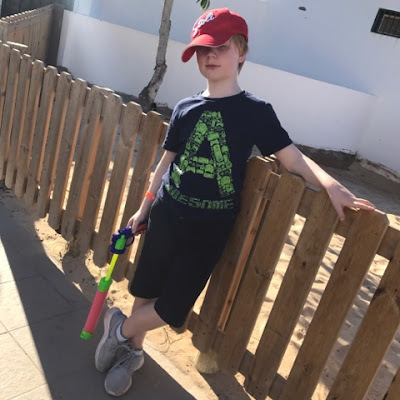 As you’ll probably know my son, Logan, is autistic and struggles with queues a lot. The Queue Assist pass allows him to enter a ride via the exit so he doesn’t have to wait and become distressed. Paultons Parks queue assist pass basically allows you to jump the queue once for each ride they have. It’s slightly frustrating when all your son wants to do is go on the same ride again and again however I do understand what they’re trying to do. Most of the ride attendants were amazing at letting us on to rides quickly however others had the idea that only one person/family with a queue assist pass was allowed on to the ride before another family could get on. This may work for some people depending on their needs however for children (and adults) with autism this can be extremely difficulty to comprehend. I think this really needs to be looked at by Paultons and maybe some staff training should be put in place. Anyway, the actual park itself is lovely. It’s big (and clean) with lots of rides for small children as well as the big ones. I was really pleased that for most rides the height restriction was 900mm which meant my daughter, Harlow, could get on lots of things. 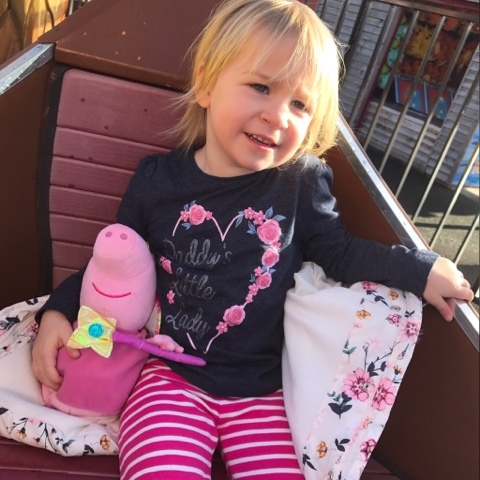 She’s 3 years old but is still short for her age which can sometimes limit her at theme parks but there was honestly tons of rides she could enjoy at Paultons. I think her favourite had to be George’s Dinosaur Adventure. Even I thought this ride was great. Our first day there we spent a lot of time on the smaller rides and for the first time ever Harlow decided to go on lots. The second day she decided she didn’t want to go on that many rides which was fine as we spent that day going on all the bigger rides with Logan so it worked out well. 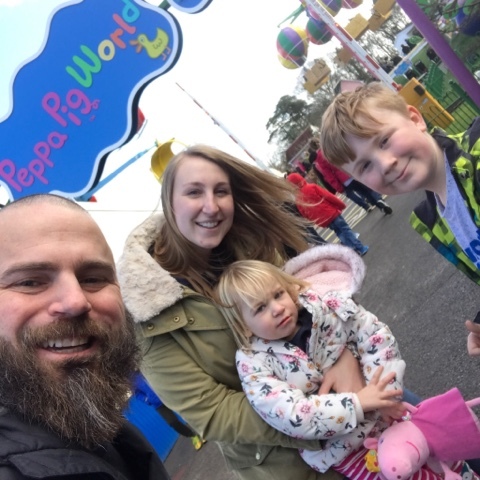 The kids really enjoyed the soft play located in Peppa Pig World. Us adults enjoyed it as well as it meant we could grab a cup of tea and relax our tired feet for a moment. 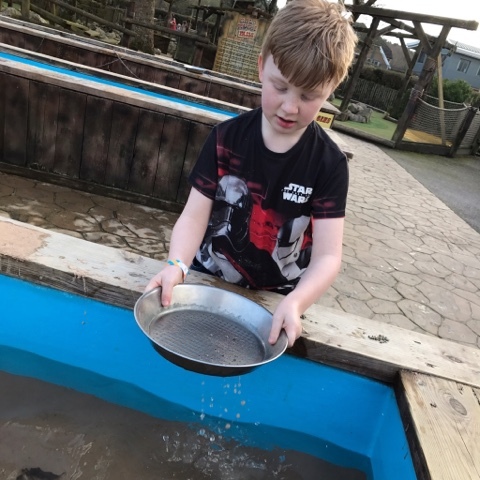 As well as all the rides Paultons Park also have some animals on site such as birds and reptiles. They’ve also just opened a new area called Little Africa which is really nice to walk around. We enjoyed the nocturnal house in the this area which is home to some lovely creatures. Logan found it fascinating to see the animals of the dark. 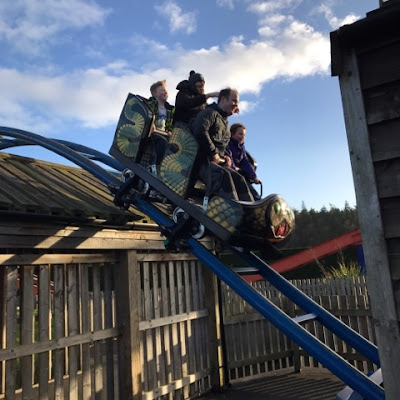 We also happened to meet up with some friends when we were down there which was lovely and it gave the kids company on the rides instead of just adults. After finishing up at the park we headed to a restaurant just 5 minutes away to grab some food and have a good old catch up. It was busy but lovely, the food was budget friendly and you got a lot of it. 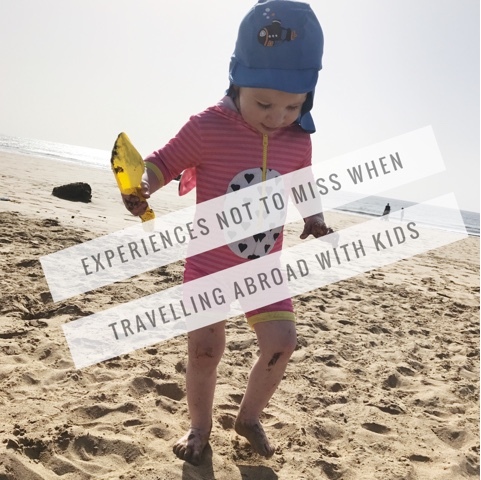 All in all it was a fantastic trip and we're looking for our next theme park to visit. We haven't done Alton Towers yet which has Cbeebies Land so I think that'll be on the cards soon. It's also closer to us with hopefully just a 5 hour drive depending on the roads but we'll save a longer trip for later in the year. Mother's Day is arriving pretty quick this year in the UK with only 2 weeks left to go! 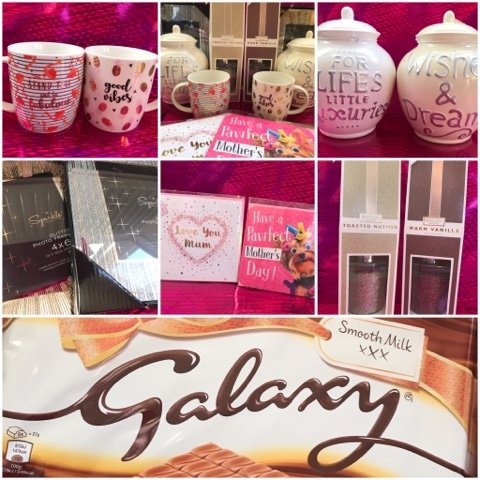 So when Sunday 11th March rolls around you'll want to be prepared with some lovely gifts to shower your mum with and show her how much she really means to you. 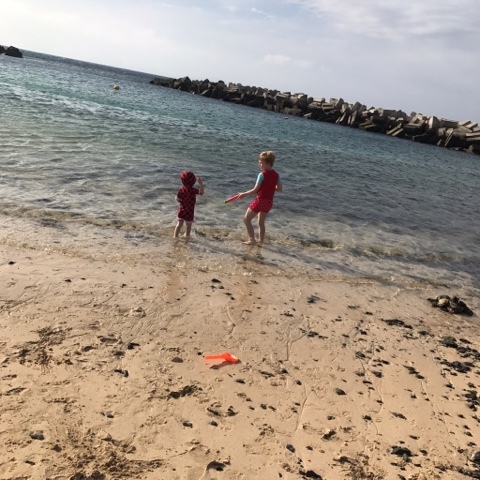 There's lots of different gift ideas out there but I've been looking at some lovely options that won't break the bank. Working together with B&M Stores I've managed to hand pick a few of their brilliant Mother's Day gifts on offer that mum will truly love. I've gone for things I think mum's would really appreciate and also things which I would love and use myself. 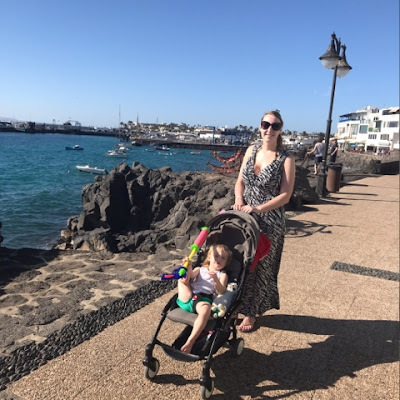 Read on then to see what I picked up for my own Mum and mother-in-law. I thought I'd start with the obvious. A lovely Mother's Day Card. I always feel a good card sets the right tone for any celebration and I tend to lean more towards the cute and funny cards. They're just really nice and it's fab to make people smile. B&M Stores have a wide range of cards to choose from and most of them are just 99p. You really can't go wrong with that. I purchased a cute "Love You Mum" card and a "Have a Pawfect Mother's Day" card which has a little dog on the front. So sweet. I love receiving chocolates for Mother's Day (or any day for that matter) so that's why I choose this giant Galaxy chocolate bar. It literally is massive and at £2.49 it was such good value compared to a box of chocolates. I like getting the most for my money, as you can probably tell, and this is such a lovely gift to give. Having a fresh smelling home is a top priority of mine so there's always candles, plug ins or some kind of smelly dotted around each room. When I spotted these gorgeous reed diffusers I just had to get them. They're so pretty and sparkly and only cost £1.99! Such excellent value and a gorgeous gift. B&M also have a lovely mum specific diffuser and votive set for £4.99 which is really lovely too. What Mum doesn't love a good old framed family photo to display for all to see? That's why I snapped up these amazing sparkly glitter frames for £1.99 each! They hold sized 6x4 photos but you can of course get the same kind of frame for bigger or smaller sizes which is handy. I'm going to find a lovely photo with the kids to put in these for the Mums. They'll love it. We're all about the savings in this house, as the saying goes "if you look after the pennies the pounds will look after themselves". I think my Mum and mother-in-law would probably enjoy a little saving challenge too and what better way to do it than with a Money Pot. These money pots can only be accessed when they're full as you have to smash them open. Great fun! And if you fill them full of £2 coins I bet there'll be a good saving of a few hundred pounds at the end. These pots are only £3.99 each and B&M have some wine bottle shaped Mother's Day ones for the same price depending on what you prefer. A good cuppa sets you right for the day so you've got to have a pretty mug to go along with it. I've starting collecting a little variety of slogan mugs myself as they're just so lovely and I know the Mums would appreciate a gorgeous mug too. From a mere starting price of £1.49 B&M have a wealth of fancy mugs to choose from. They of course have Mother's Day specific ones but I really like the two I chose - Good Vibes and Stand Tall & Be Fabulous. 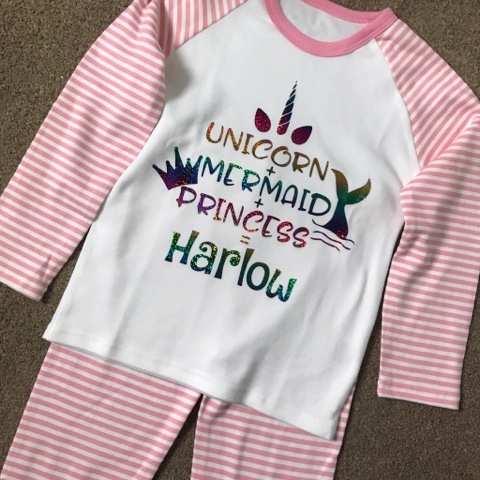 After all of this I finally purchased some holographic large pink gift bags at £1.29 for two which fit everything in and altogether I spent just £13.59 per Mum. 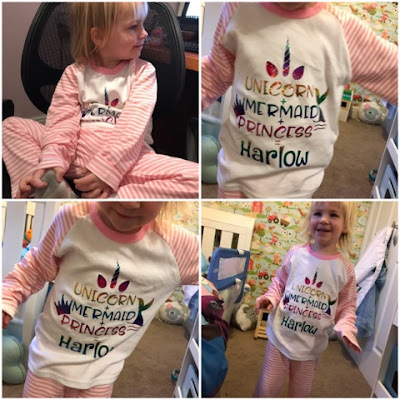 I think you'll agree that both Mums will love all of these gorgeous presents and it definitely hasn't broken the bank at all. If these gifts aren't for your Mum though don't worry. B&M have a brilliant selection of other lovely gifts to choose from. 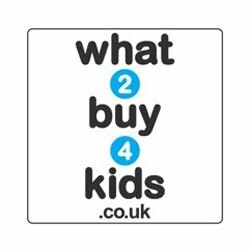 Why not check out their website to get an idea of what they have. Simply click on the Mother's Day link at the top of the page. This is collaborative post. All opinions are my own. 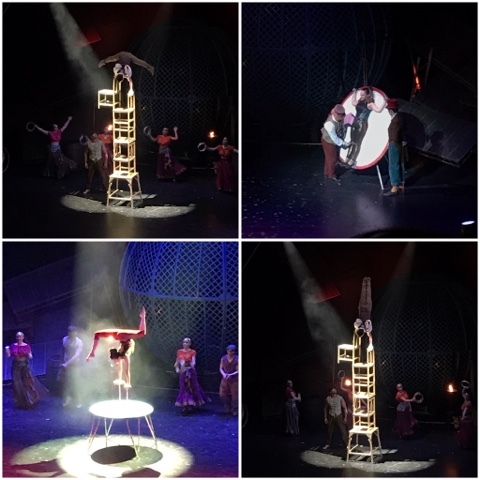 A circus is one of those things you've just got to go and see in your life time. 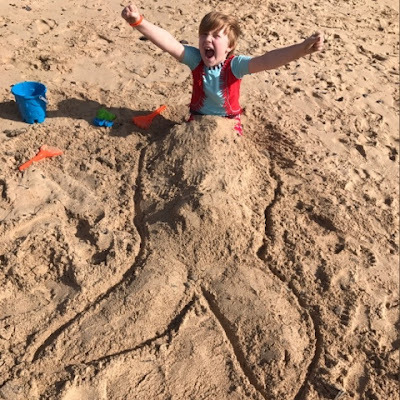 It's family fun at it's best and the kids love the magic and excitement of the whole event. 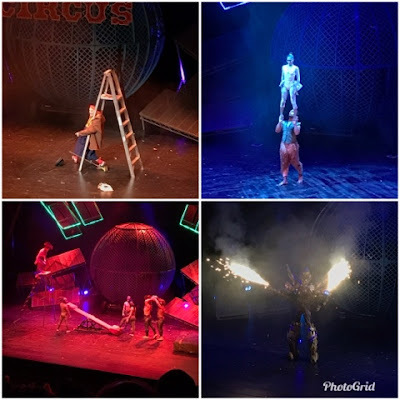 I've never taken Logan to a circus before but have been meaning to for a few years now. He loves watching cool stunts on youtube so the circus is the perfect show for him to go and see. 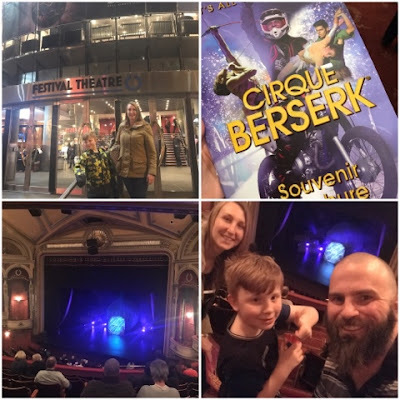 Luckily for us then that we were invited along to see the amazing Cirque Berserk at the Festival Theatre in Edinburgh on Tuesday. It's a real circus made for the theatre and we couldn't wait to see what acts they had in store. The hubby, Logan and I decided we would get the train through from Fife to save rushing around with parking and the traffic plus Logan quite enjoys the train journey. When we arrived at the Festival Theatre we grabbed some drinks, sweeties and a brochure to see what was to come. 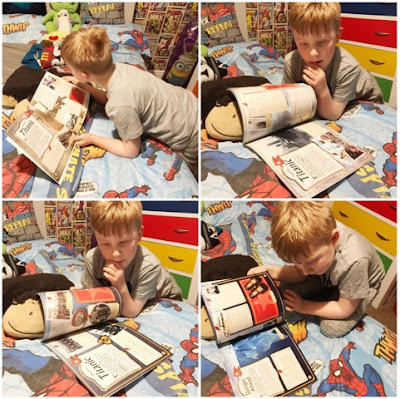 Since we had a few minutes to wait it was the perfect distraction to keep Logan busy reading about all the different performances he would be watching on stage. Soon we took our seats and waited patiently for the show to start. Before the lights dimmed though an announcement came over the speakers to let everyone know that the show was very interactive and taking photos and videos was massively encouraged. This was really refreshing as most shows aren't like this at all. 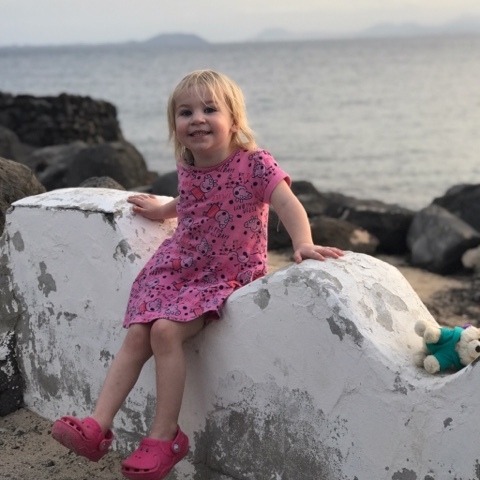 We were also encouraged to share our pics and video footage on social media which is great as I know a lot of you like to see what I'm up to on my insta stories. So of course I shared loads and will probably keep putting up little videos now and again. As the music started and the curtains opened the fabulous Timbuktu Tumblers bounced their way onto the stage with much enthusiasm. 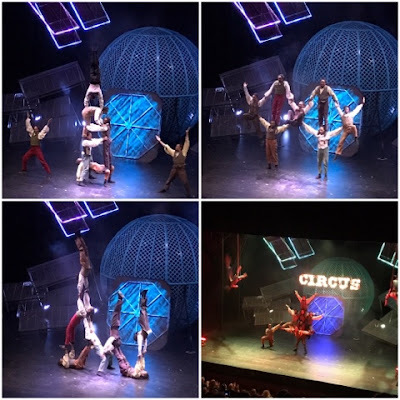 They're a fabulous bunch of African Acrobats with a complete zest for putting on a brilliant show. From that moment on the three of us were captivated by one act after another! You can see that it's a completely professional show with time, care and dedication put in by each personal involved to make it awesome. One of my favourites had to be Germaine Delbosq who is an amazingly skilled footjuggler from France. She honestly threw those balls, rings and fire about like it was nothing. I loved it all. Logan's favourite had to be Tweedy the Scottish clown. He was clumsy, cheerful and full of mischief. Just what every 8 year old loves. The hubby's favourite was the fantastic Lucius Team who performed the motorcycle Globe of Death! It was amazing and scary to watch all at once. I was peeking through my hands at some points. 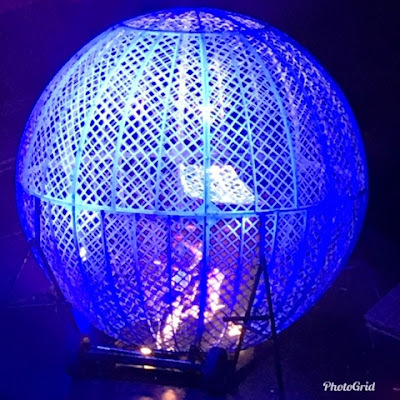 These are just a few of the acts from Cirque Berserk which will delight and fascinate you and have your heart jumping into your throat in equal measures. It's honestly amazing and Logan has been telling all his friends about it at school. So if you have time this week I highly recommend getting yourself to the Festival Theatre in Edinburgh to experience the magic of Cirque Berserk. If you miss it don't worry as the show is in Glasgow from 7th June so get booking those tickets asap! I was provided with tickets to see the show in exchange for an honest review. All opinions are my own. 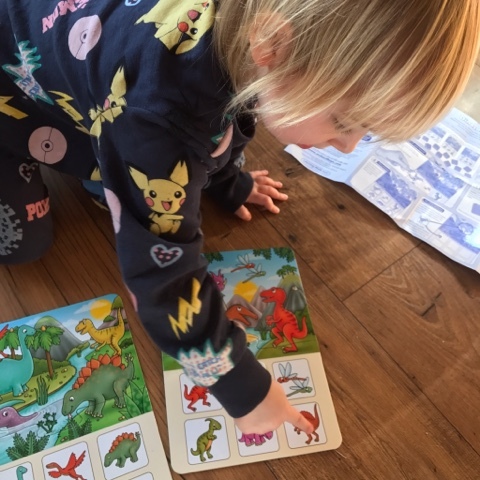 Orchard Toys have recently released a whole host of new games and jigsaws to the market and Harlow has been lucky enough to receive one to review. Harlow was sent the Dinosaur Lotto game and couldn’t wait to get stuck in when it arrived through the door. Dinosaur Lotto is a simple fun dinosaur themed matching and memory game which is sure to capture the imaginations of little ones. It’s suitable for ages 3-7 and has two ways to play. You get 4 double-sided jigged boards, 24 item cards and an instructions sheet with the game. 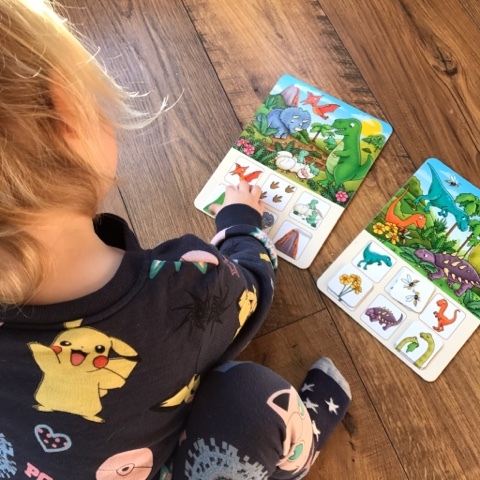 It really is a lovely game which players will grasp quickly and the aim is to take it in turns to turn over the colourful dinosaur cards and be the first to fill their dinosaur board with matching pictures. Like I said there are two ways to play, with the jigged boards having both illustrated and blank sides for simple or more challenging gameplay. This means that both younger and older players can play at the same time by choosing which side of the board they want to suit their needs. So the illustrated side of the board has photos of the items you need to fill your board whereas the blank side doesn’t. The illustrated side is obviously easier to fill however in order to fill the blank side you need to look at the dinosaur picture provided (at the top of the board) and guess what cards match the picture. It’s a great challenge for older children. My son is 8 and he stilled enjoyed doing this with his little sister. He’s competitive so of course wants to win! 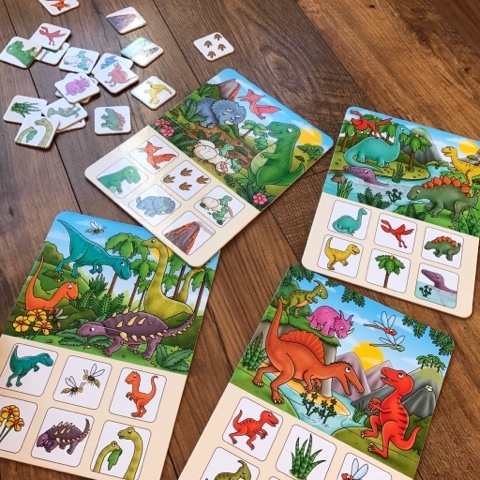 As well as being a great game it’s also a brilliant way for children to find and identify dinosaurs as there’s a wide variety of characters to spot and discuss. Not forgetting how colourful this game is as well which will help reinforce recognition for the younger players. Harlow’s quite good at her colours but sometimes gets them mixed up. 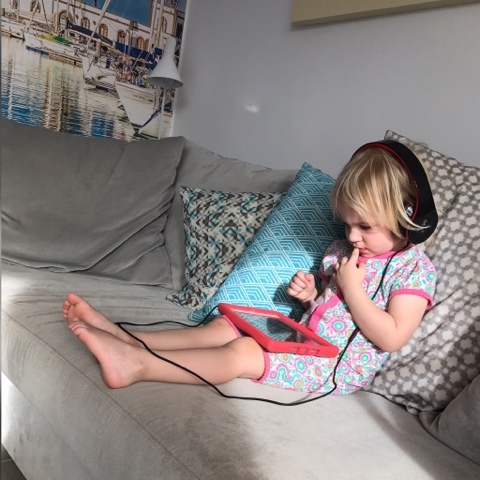 This game has been perfect for swatting up on her skills especially when I ask her to look for the green dinosaur or the purple dinosaur etc. What I really love about this game is that it takes seconds to set up and play but also seconds to put away. It’s great for bringing out to have some one to one time or to play as a family. It’s also a really handy size for taking on trips and holidays too. When we next go up North I’ll be packing this in the suitcase to take with us along with a few of the other portable Orchard Toys games. Overall a perfect family fun game which I’d highly recommend. 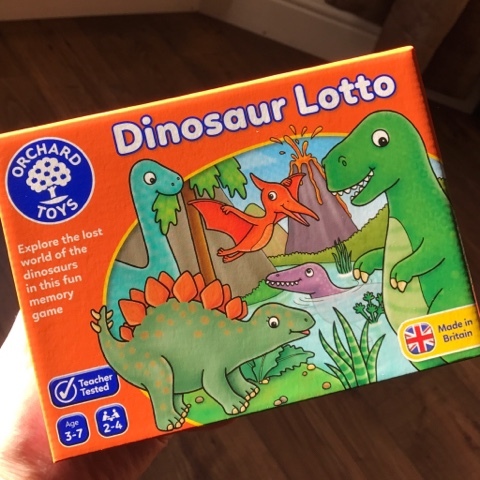 Dinosaur Lotto retails for £7.50 so won’t break the bank and it’s fab for those dino mad kids in your life. As an extra little bonus Orchard Toys have a lovely section on their website entitled Things to do. 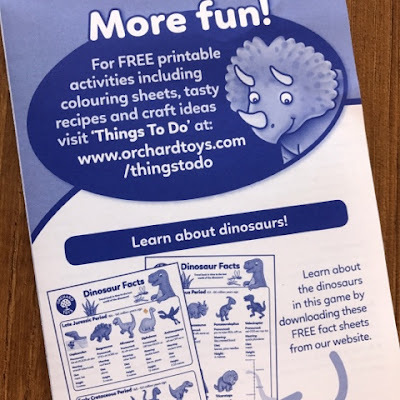 If you click in there you’ll be able to find some free fun fact sheets on dinosaurs. It’s a great way for some extra home education and learning. We were sent this game in return for an honest review. All opinions are my own. Last week I was lucky enough to be sent some tasty chocolates from The Grown Up Chocolate Company. I couldn't possibly have said no so of course agreed to do a review of their scrumptious goodies. I was sent a box full of their treats and honestly couldn't wait to tuck in. So why the name The Grown Up Chocolate Company. Well the idea behind the Grown Up Chocolate bars is that they are reminiscent of the bars we all ate as children, but re imagined for Grown Ups only. I wish I could have kept mine for the grown ups only however the kids had other ideas! 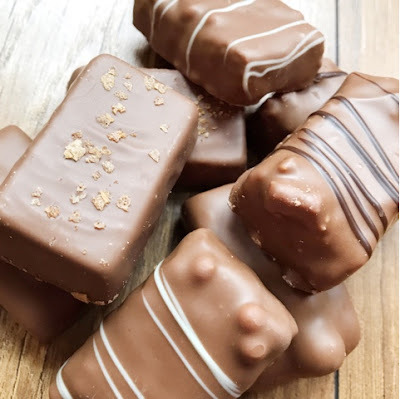 The chocolates are super tasty though and use only the highest quality ingredients with 41% of pure cocoa solids - an exceptionally high ratio compared to the market standard of 18%. 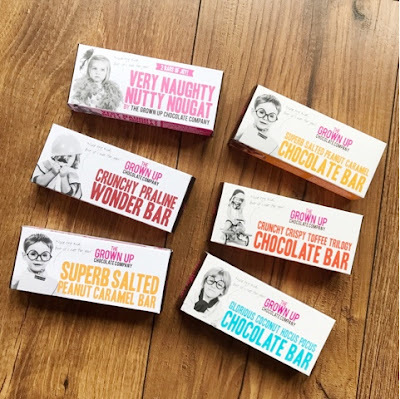 I received a few different flavours to try; crunchy crispy toffee trilogy chocolate bar, crunchy praline wonder bar, superb salted peanut caramel bar, very naughty nutty nougat and glorious coconut hocus pocus chocolate bar. I also received a couple of boxes of their chocolate cups; heavenly whole hazelnut praline cups and perfectly buttery peanutty chocolate cups. I think my favourite had to be the chocolate bars with the salted peanut caramel. Oh my goodness these were amazing!! I tried my hardest to share with the other half but sneaked a few of these to myself. 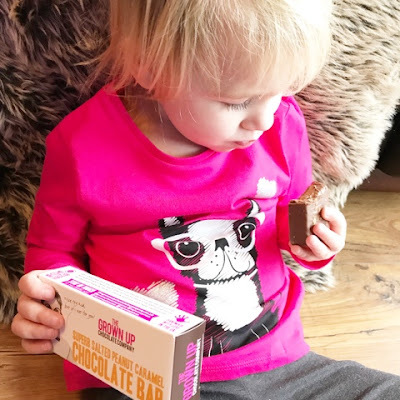 In each chocolate bar box (around 70g) you get 2 snack sized bars and in the chocolate cups boxes (around 80g) you get 6 cups to enjoy. I would say share but they're so delicious there's hardly going to be any chance of sharing on the cards. The individual bars and cups boxes retail for £2.25 however The Grown Up Chocolate Company have lots of offers on their site to choose from. 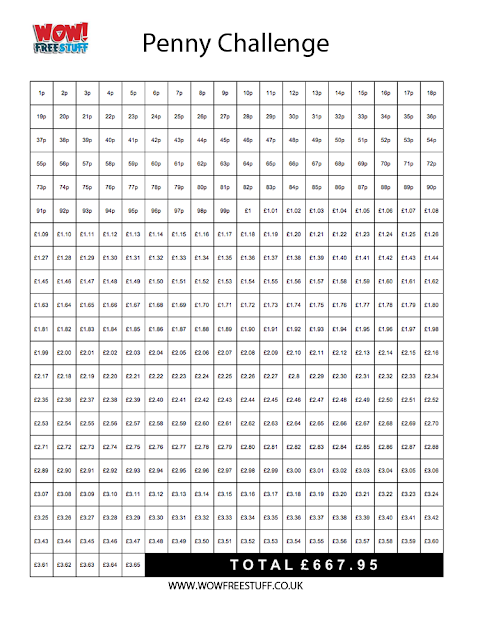 For example you can purchase 10 bars for £20.09 or even 100 bars for £165. They would make excellent wedding favours and if you purchase 100 that works out at £1.65 per bar box which is fantastic. What I really love about The Grown Up Chocolate Company though is that you can make your very own personalised chocolate bars from a wealth of ingredients. Things such as mango cubes, nutmeg, fig & port, poppy seeds etc. There really is loads of choice and how awesome would it be to give this as a gift! Totally understand if you kept it for yourself though as they're so tasty. Everyone in our house (including the kids) loved the chocolates I was sent from The Grown Up Chocolate Company. They must have been devoured in less than a week, that's how heavenly they were to eat. If we hadn't eaten them too quickly I would have popped a few in my hand bag as an emergency snack stash for when I was working in the office. It's always handy to have a piece of chocolate on hand when you're stressed out with spreadsheets. Overall 100% amazingly moreish bite sized pieces of chocolate that'll leave you wanting more. Highly recommend if you fancy something different to the old boring chocolate bar you have in the cupboard and also recommend as giving to someone as a gift. Say like Mother's Day (hint hint). They'll be talking about it for weeks afterwards. Carlton Books have some new releases on the shelf soon which have excited the kids no end. Logan and Harlow were lucky enough to receive a book each to review with Logan getting The Story of the Titanic for Children and Harlow getting My Perfect Puppy AR. 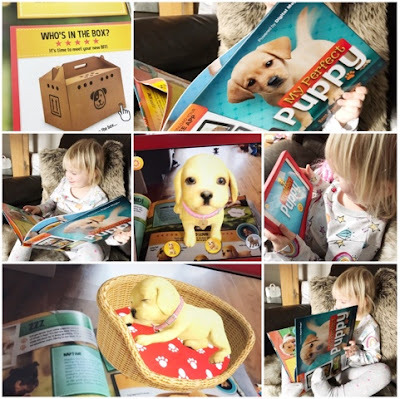 As you'll have seen from our previous reviews Carlton offer a wide variety of Augmented Reality books for children and My Perfect Puppy AR is an excellent new addition for young readers. With technology such a big part of our world now combing tech with books is a genius idea. My daughter loves her stories at bed time but adding the AR is an extra delight to book reading and interacting. So with the My Perfect Puppy book and accompanying app (which can be downloaded from the app store), children can take care of their very own Augmented Reality pup. All the fun with no mess. Each page of this book is bursting with cute puppy photos and all the info you'll need to know how to care and look after your new friend. 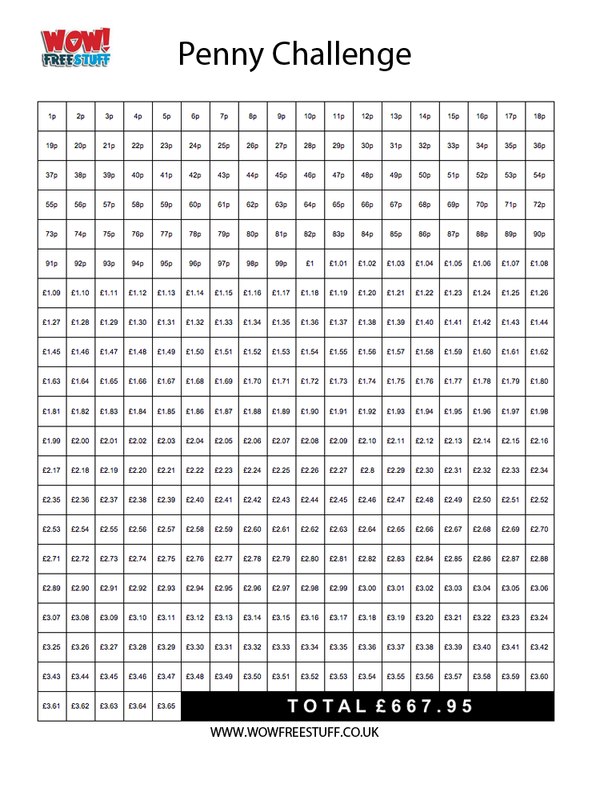 To make things more exciting there are 13 special interactive pages so loads to get involved with. It's simple and easy to use as well. You download the free app, point your phone or tablet's camera at the book and say hello to your new virtual friend! There's so much you can do. You get to name your puppy, feed it, play with it and teach it new tricks and commands. You can even taken photos and save them in the My Perfect Puppy Hall of Fame. Harlow personally loved this book and found it fabulously amusing to be able to interact with a virtual puppy using her iPad. It was easy to do and scanning each interactive page was no issue. I think her favourite was getting her Puppy (named Pup) to play the piano and fetch. She also loved choosing accessories for her puppy to make him look pretty. Next up is Logan's book - The Story of the Titanic for Children. 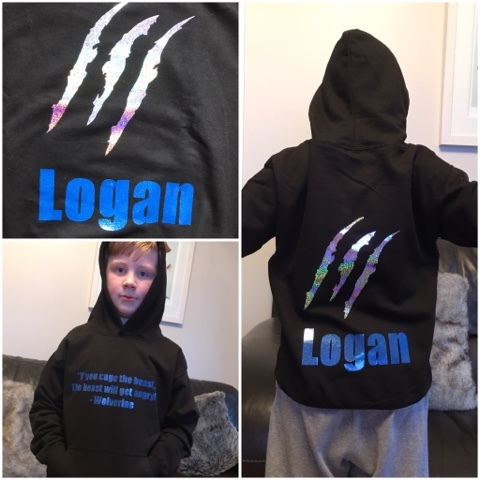 As most of you will know Logan is a collector of facts and loves to share his acquired knowledge with the world. So this titanic book is perfect for him. This paperback has 48 eye catching pages which are full of facts, photos and illustrations sure to ignite your little ones imagination. 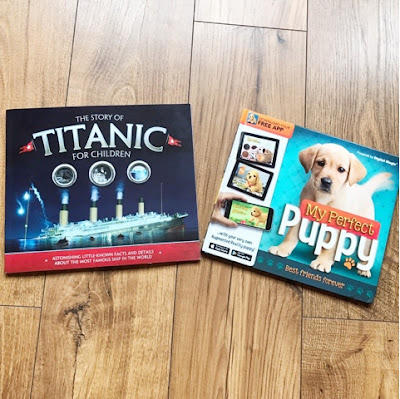 The titanic is of course a very famous ship and this book helps to teach your little one the great history surrounding the legend. Logan was particularly fascinated by the stories of the children on board and also couldn't believe how big the iceberg was that sunk the ship. He found it incredible how most of an iceberg is submerged underwater and only a tiny portion is seen from the surface. 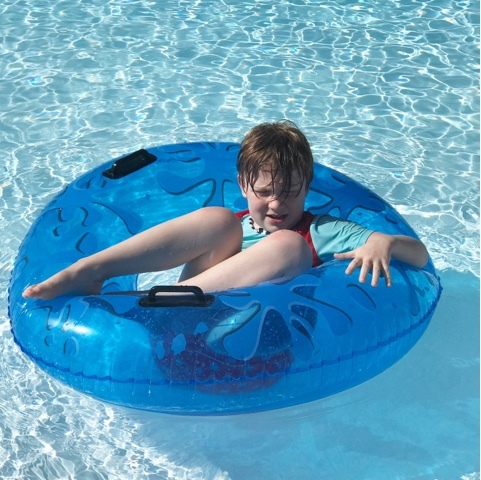 Another snippet to fill him with joy was the youngest survivor of the titanic who was 7 weeks old at the time but lived to 2009 (the year Logan was born) at the ripe old age of 97. So if your little one is into history, facts, boats, ships, the sea etc then this book is definitely for them. The Story of the Titanic for Children will satisfy even the most curious minds. Carlton Books of course have lots of other fabulous reads on their website for children so do go and take a look. Luckily for all you readers I also have a copy of each book to give away. So simply enter via the rafflecopter widget below as always and good luck! I'm lucky that I can mostly read the other half like a book and usually know what kind of gifts and surprises he's after on special occasions such as birthday's, Christmas, anniversaries etc. So with Valentine's Day coming up in just over a week I thought I'd put a little gift guide together with the things I think he would quite appreciate and like to receive. 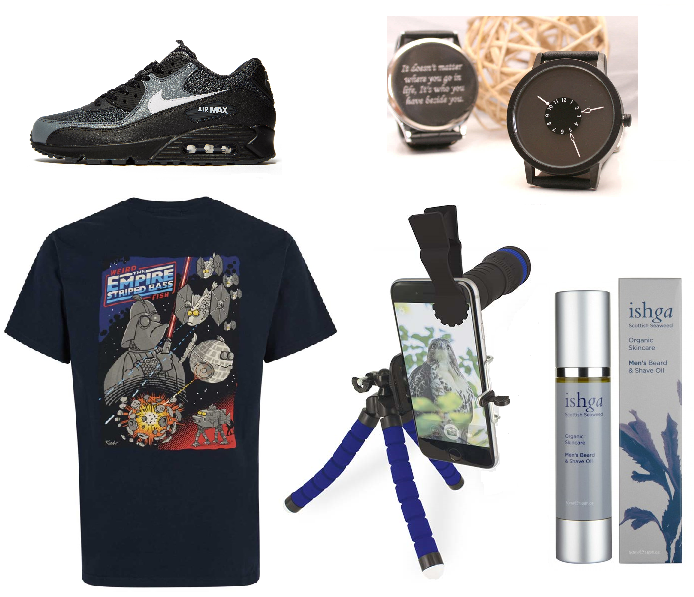 I've gathered together a few different gifts with a variety of prices which I'm sure will suit a lot of men out there. Read on to see what I've selected. If your hubby is a child of the 90's then they're probably still in love with trainers as a daily footwear choice. My other half loves a good set of trainers and the brighter, bolder and funkier they are the better. I usually pick from the Nike website as there's always a sale on and they tend to have a good selection to choose from. There's even some Nike Jordans for as little as £69. The other half is a mad watch collector but he currently doesn't have any personalised watches in his possession. I find this strange because he absolutely loves watches so I would have thought he'd have a personalised one by now. I'm never too sure about personalised gifts as I worry I'll mess it up or get something wrong however GiftsOnline4U let you check it all before ordering and have some amazing engraved gifts for men to choose from. So if your man doesn't wear a watch you can always get him a hip flask, whisky glasses, work tools, pocket tools etc. There's something to suit everyone. I chose a watch though as he'll love it and the one I choose has an unusual face (see photo above) with a lovely leather strap. The engraving on the back is clear and perfect. I went for "time will always tell how much I love you..." soppy I know but very true. You can pick up a personalised wrist watch for as little as £40 so definitely not going to break the bank but it's such a lovely personal gift to give. One that will be cherished and well thought of for years to come. There's never normally an occasion goes by where I cannot purchase some sort of gadget for the other half as a present. I always try to get him something different and quirky and that's why this discovery channel smart phone telescope is perfect. He's constantly on that iPhone of his so I'm sure he'll love trying out this little beauty. And when he's not using it I'll be stealing it to nosey in on the neighbours, haha. This is of course a cheeky joke (or is it!). 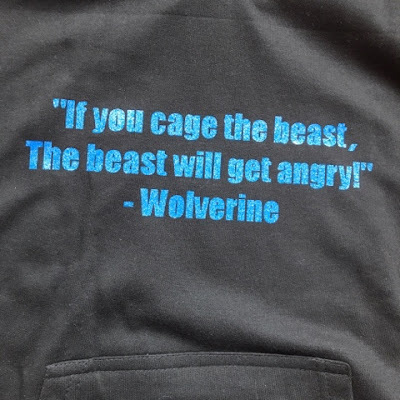 I love buying my other half a good slogan t-shirt and I always find funny ones from Weird Fish. They have plenty to choose from online but if you're anywhere near the Livingston Designer Outlet they also have a shop in there with t-shirts from as little as £10. Quite the bargain if you ask me. If you do a quick search online you'll also find many a slogan tee to choose from as well. I believe Amazon have a good few for a decent price as I bought a couple of them for Christmas presents last year. 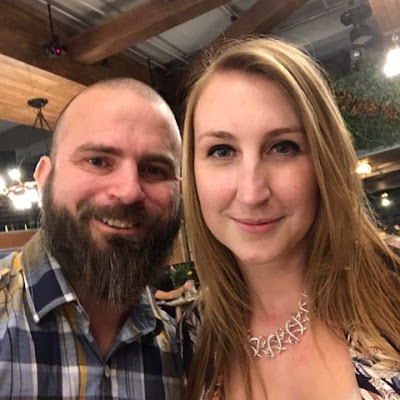 If you haven't already noticed from my photos and Instagram feed then my other half has a beard. He loves using beard products on it daily such as beard oil, balm, combs, conditioner etc so getting him a set of beard grooming products will go down a treat. I love the beard oil from ishga as it smells amazing and you get a massive bottle for £45. There are loads of other fab beard companies out there though so do shop around to find the perfect gift. 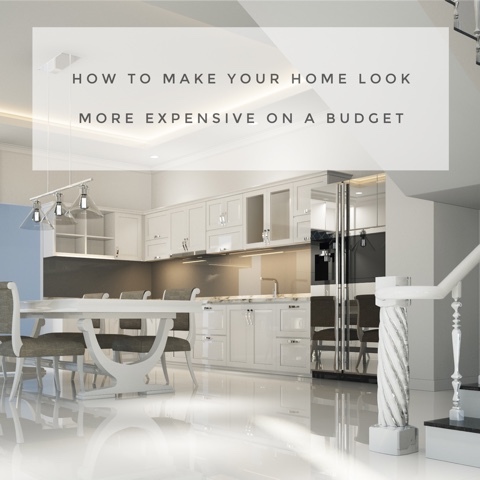 If you're like me and you love making your home look fancy and expensive but don't want to spend a fortune then this post is for you. I'm going to share with you my tips on how to make your home look more expensive on a budget. It's really simple and anyone can do it, you just have to know how. 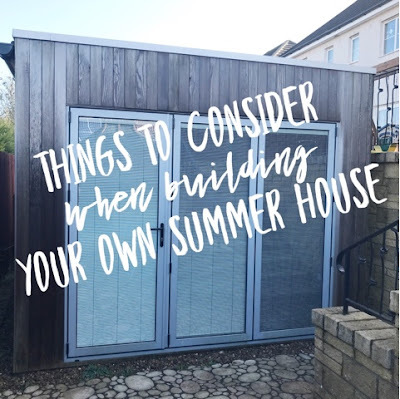 The last rooms we decorated and freshened up in our home was the kids rooms and it's now time for my bedroom to get a little makeover. It's been the same for the past maybe 6 years or longer and it's about time I changed it. So here's a few of the things I'm going to do to make it look fabulous with very little money. We do currently have matching furniture for the bedroom but we've had it for ages. It would be really nice to get something new and exciting so I'm going to look at some second hand stores, outlet stores and any end of line discounts in furniture stores. You just never know what you can pick up and I'll also have a nosey online to see if there's any good bargains on there to be had. It really doesn't have to cost a fortune to have nice furniture. I could always be really thrifty and give my current bedroom furniture a new makeover with a lick of paint. The options are endless and it saves waste. I think having the right accessories around your home is definitely key to making it look more opulent and loved. Things like matching cushions, luxurious throws, scented candles or reed diffusers, paintings and prints for your wall. 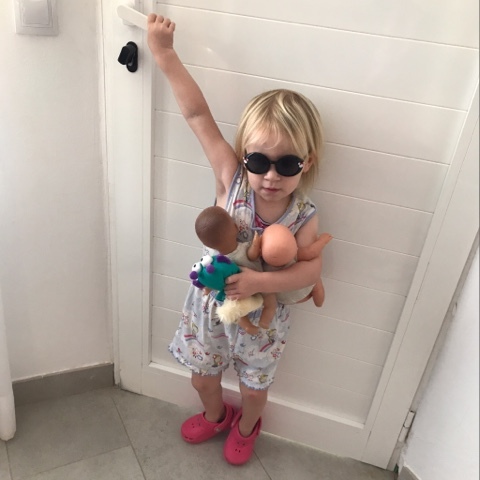 All the little details make such a difference but you can pick up some gorgeous accessories very cheaply from high street stores as well as online. If you're like me and you love a good candle as well do a quick search online for a Yankee candle sale as there's always plenty to be found and they make your home smell amazing. A fresh lick of paint on the walls will instantly add the luxury feel to any home. Keeping the walls light and crisp can lend to an air of sophistication and also allows for rotation of furnishings and colour. Like I said my bedroom currently needs a make over and it's a rich mustard/yellow at the moment. I've grown sick of it though as I can't do much else with it so I'm going to go for possibly a light grey or white walls next. It just leaves so much room for adding detail and colour in elsewhere. I haven't bought fresh flowers for ages but 2018 is going to be the year I start and they won't just be for the living room or kitchen either. Instead I'll spread them around the home and have smaller arrangements throughout the one living space so it adds to the sophisticated look. It's kind of like what hotels and stately homes do. Fresh flowers also add some much needed colour and draw the eye, they also don't cost the earth so are quite practical. Clutter and mess definitely don't scream luxury so try and keep your space as tidy as possible. I know it's harder when you have kids but good storage can definitely help. Ikea have loads of different storage solutions so start there as they're very cost effective. I haven't had a look around Ikea myself for ages but we do need more storage ideas for our house so I must take a trip soon. Last week the hubby and I had a free night to ourselves so we headed into Edinburgh to have some couples time without the kids. It was Burns Night and we'd been invited along to Brewhemia to enjoy their burns supper. I honestly couldn't wait as I've never really done a proper burns supper out before (I know, shocking since I'm Scottish) and to make it better I made the executive decision to get the train through from Fife instead of driving in case the roads were busy/ hassle looking for parking etc. Brewhemia is towards the Edinburgh old town so when we got off the train we headed that way. I was super surprised to see that the restaurant was directly outside the train station! How amazing is that for transport links. It also meant I could wear my heels for a change (which I never do anymore) and not have to walk far at all. When we arrived it was a little busy at the front desk waiting to be served and shown to our table. I can only assume this was because it was a special night i.e. the burns supper but we were quickly directed away from the bar/pub area and through to the dining area. Through here we were seated quickly and efficiently. As I've mentioned it was a burns supper night so we opted for the set burns supper menu which was £30 per head. I thought this was excellent value for what you received. With this menu you were given 4 courses plus a glass of prosecco and a nip of whisky to toast the haggis of course. It's worth mentioning that you didn't have to have the set menu and could have ordered from their regular menu as well. Settling down for the evening I surveyed the dining area as the other guests started to arrive. 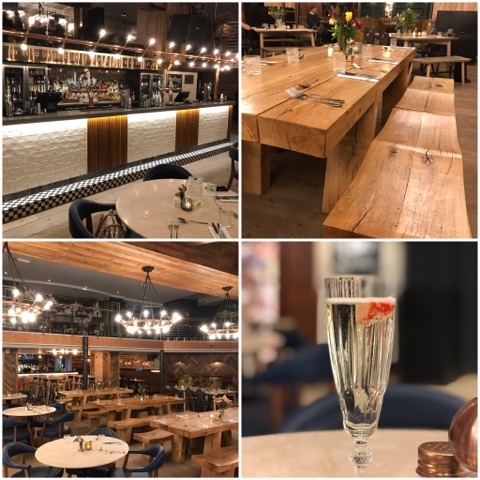 It's a gorgeous large area with high ceilings, a balcony wrapped around, an area for performers above the bar and a delightful friendly relaxed atmosphere. All the staff seemed in good spirits and our lovely waitress for the evening explained all the entertainment that would be going on whilst she served our drinks. 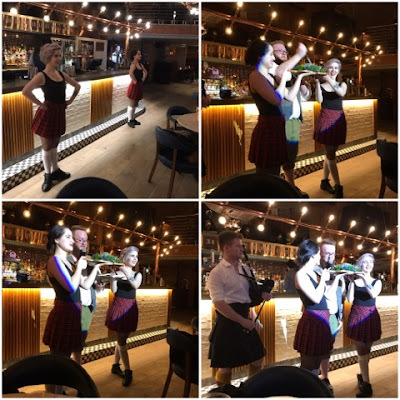 There were promises of bagpipes, poems, Scottish dancers, piano music played live and of course a toast to the haggis. It all sounded so exciting and I couldn't wait to see for my own eyes. Before long the first course was served which was a small appetiser to get your taste buds started. 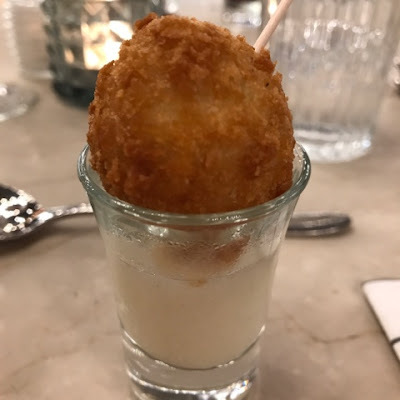 It was a lovely crispy cod ball with accompanying sauce. So delicious and I could have easily eaten a tray to myself! After this a young chap playing the bagpipes came out followed by some Scottish country dancers. It really set the night and was great to have entertainment with our meal. Soon the lovely Compare for the evening, James, arrived to have a chat and toast the haggis. He was brilliant and so lovely. By this point I was starving and thankfully the starters were literally coming out of the kitchen and being served. 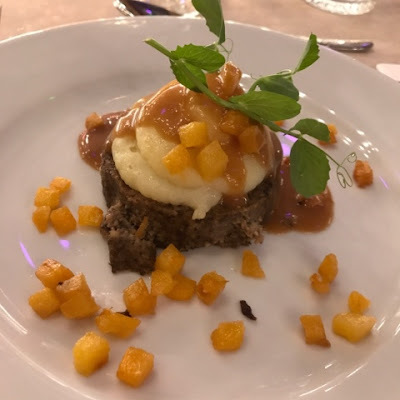 It was a scrumptious dish of posh haggis, neeps and tatties with a whisky sauce. Oh my it was so good! The live duelling piano duo, Howl At The Moon, had now set up for the evening and were handing out request cards to the diners below. I requested All The Single Ladies by Beyonce but I wasn't around to see if they played it or not. I'm sure they would have though. 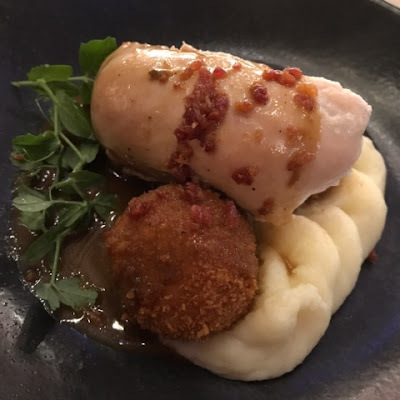 The main course was now being served and it was a delicious Balmoral chicken. You would think you would get sick of haggis but you really can't, it's just too good. Last but not least our dessert arrived. It looked amazing and honestly tasted even better. 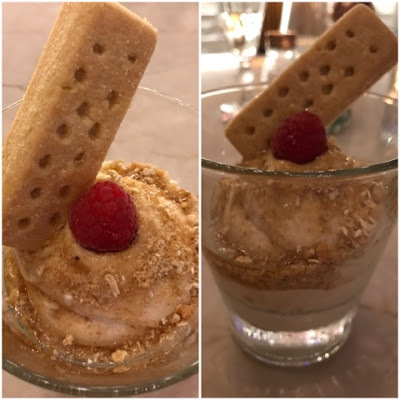 I'd rather go for a starter than a dessert myself but this Cranachan we were served was mouth watering. To top it off it was served with Scottish shortbread. Absolutely delicious. The hubby and I had such a fantastic night here, so much in fact that I ended up purchasing a gift voucher for my father-in-law as a birthday present! He'll love getting out for a meal with my mother-in-law especially since Brewhemia have the duelling piano guys every Thursday night. I can hand on heart say I'll definitely be back myself and probably with friends and other couples this time. I've even thought about having the works Christmas lunch here! Highly recommend booking a table and getting yourself down to Brewhemia folks.